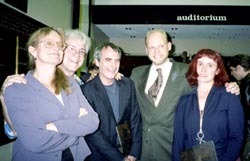 The Awards program was held from 7:30-8:30 PM, May 18, 2001, at the Swayduck Auditorium at the The New School University, New York City. The Awards event featured rousing opening remarks by Marjorie Luesebrink of the ELO board of directors, presentation of the works shortlisted for the prizes by ELO Literary Advisors Rob Wittig and Stephanie Strickland and the presentation of the Awards to the winners by Judges Larry McCaffery and Heather McHugh. Additional features included a live performance of Mez's chat-streamed text, direct from Australia, and a video clip by Komninos Zervos. The entire event was streamed live over the web to viewers worldwide. Scott Rettberg, ELO's executive director, introduced the Awards. He had some comments on the jurying process, and offered speculations on possible new categories for the Awards in years to come. These were presented at the Awards on video, and you may view the video here, through RealPlayer. More photos by professional photographer Star Black and video from the event coming soon. ELO acknowledges the support of our global sponsor, the Ford Foundation and the Rockefeller Foundation for their generous support of the Electronic Literature Directory project. We also thank our hosts at UCLA: the Center for Digital Humanities, the English Department, the Design| Media Arts Department, the School of the Arts and Architecture, and SINAPSE. We thank also the Illinois Humanities Council and the Illinois Arts Council, who supported the 2001-2002 Interactions program, 2001 Awards and founding sponsor ZDNet and founding sponsor NBCi.